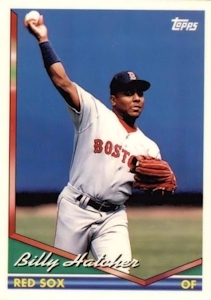 ON THIS DATE (April 22, 1994) ... Billy Hatcher stole home at Fenway Park for the second time in three years. With the Red Sox trailing, 5-4, in the bottom of the seventh, Hatcher dashed home with the tying run. The Sox went on to another dramatic victory, 6-5, their second win in as many games and fourth straight, when Mo Vaughn singled with the bases loaded in the ninth off Angels reliever Craig Lefferts. Manager Butch Hobson said he's given his team the green light, but he looked dumbfounded when Hatcher broke. Third base coach Gary Allenson didn't have any idea Hatcher would attempt it. The Angels thought something might be up when Hatcher reached third on Greenwell's ground out. Finley attempted a pickoff with Tim Naehring up, but Hatcher just got back to third safely. Finley's pitch actually was outside for ball four, but Hatcher already had come across. The winning rally started when reliever Bill Sampen walked Nixon to start the ninth in a 5-5 game. After Nixon was advanced on Hatcher's sacrifice bunt, Greenwell singled to right off Lefferts, putting runners at first and third. The Angels walked Naehring intentionally to load the bases, and Lefferts went 2-2 before Vaughn lined the winning hit to right.